Site design updates are live! 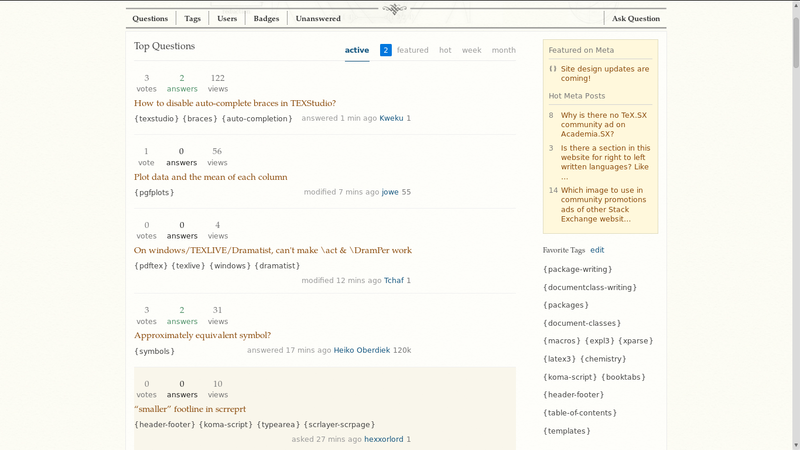 I'm a designer for Stack Exchange, and I wanted to give everyone a heads that minor site design updates have just launched. We are moving the site's CSS to a newly refactored LESS system, so that it's easier for us to fix SE network CSS bugs globally and launch new features in the future. We are updating the graphics to SVG for retina support. We've fixed a LOT of obscure bugs that arose when new features were not thoroughly tested across the entire network. Visually it should "feel" the same as the old site with slight layout adjustments. This update should also retro-actively fix most of the old design bugs. If you see any new bugs, or old ones not yet fixed, please post an answer here to let us know! Question titles in the list are smaller, vote counts on the question page is lighter and greyer, tag names are extremely small, question text is extremly large. Here is the comparison of what I see now vs what I saw before (thanks David for the archive link). Could you please, while you're at it, finally fix the top title panel size? The integral on the right used to be completely visible (now the top of capital Phi is hidden), also the tengwar text on the left used to have a top padding. The arrow with reduction in the chemical formula is ridiculously hidden under the tabs "Users" and "Badges". Despite Anna Lear suggest this has been solved, it has never been, and I wasn't able to convince her about it. 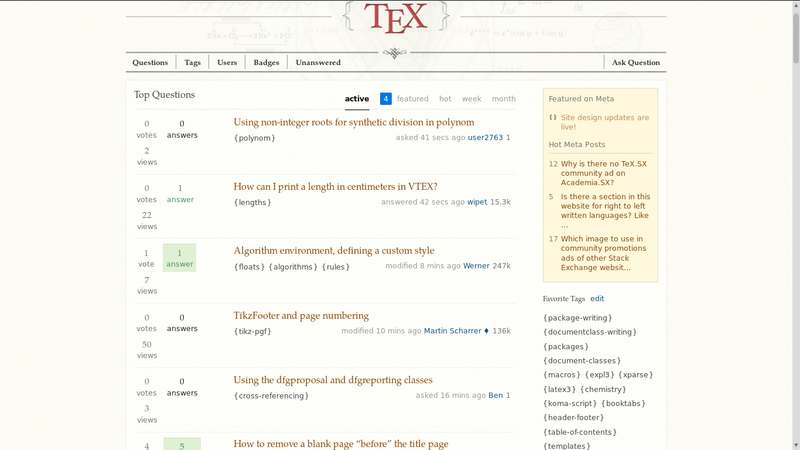 In the homepage https://tex.stackexchange.com/ all fonts seems to be a bit small (on 1920x1200 monitor). After the facelift, for a second I thought I have accidentally zoomed out. 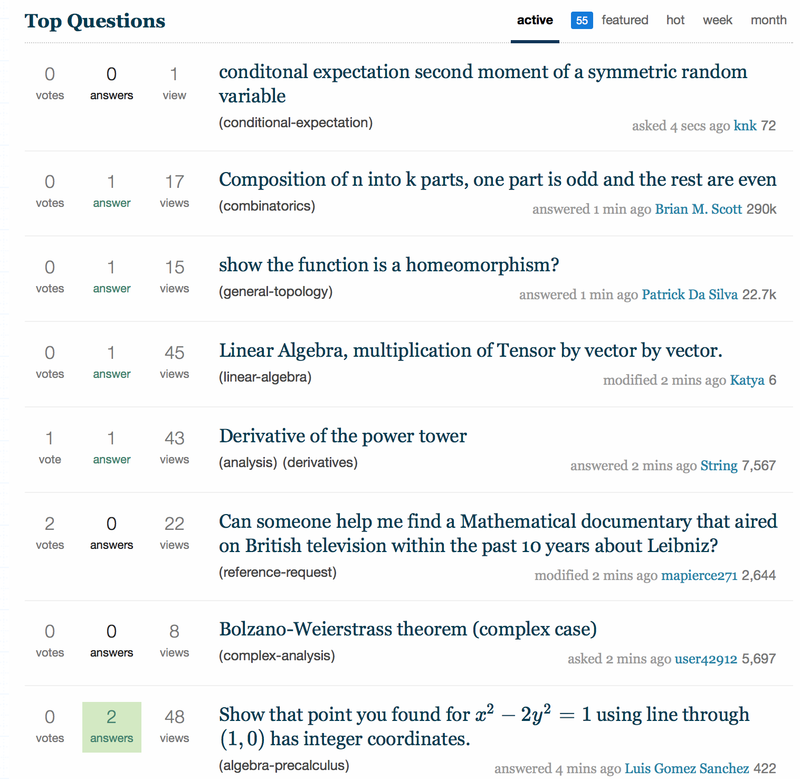 In the profile page, when hovering over the list of answers (sorry, can't look at the list of questions ;-)) they “dance”: an underlining appears, pushing down the answers below by some pixels. This doesn't happen on Math.SE, for instance, where the changes have already been applied, AFAIK. 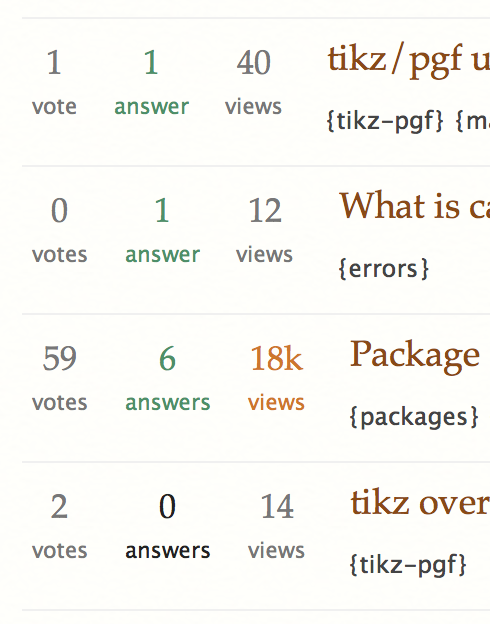 If I hover over the “Summary/Answers/...” bar, a “votes” moving button appears at random positions. Please, remove the cold blue colour from the title page (active etc. tabs). It's been mentioned in the comments here and you said that this is intentional. That doesn't change anything on the fact that it's ugly. 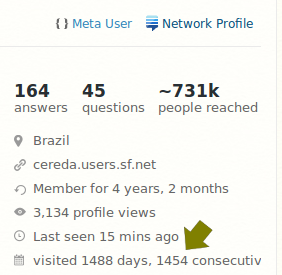 On my user page (Meta and Main), links to questions/answers get a double underline when hovering over a certain section of them. When hovering over other "hot" areas on the same question/answer link, only a single underline appears (as I would expect). The appearance of the second underline also causes a slight change in the height of the element, which causes the list of links to shift up and down slightly while moving the mouse. This seems to have been fixed. I gathered up as much patience as possible and waited for multiple profile entries to have large numbers in front of them, and not wrapping occurred. I'm sure wrapping will occur if there are more items with larger numbers, but this may not affect many users, if any. It dangles to the bottom-right of wherever you hover over the other tabs. i'm not on the system i usually use, so it's hard to know whether the changes i see are system-specific, or intentional changes. the community promotion ads seem to have disappeared. in the header (and already mentioned) it used to be possible to actually read the tengwar, and to see clearly whether there were any superscripts or upper limits on the math formula in the upper right. what is there now is not valid, typographically speaking. In addition to what the others have said so far, the fonts, the missing logos etc ... I see questions on their own line, i.e. some linebreak is introduced. Same on meta, by the way. In the change to Retina graphics we seem to have lost the witty detail of having the meta site header echo the Metafont logo, as suggested in Nothing indicates that the meta site is meta..... Could we revert to that font please? 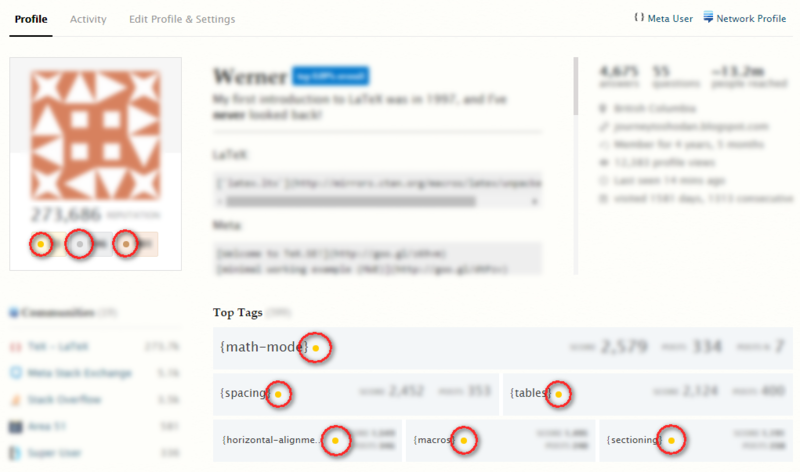 The interline space was too large before the update for related tags. But now, the problem is worse because the text is so much smaller, and it also affects the list of favourite tags. Suggestion: Perhaps a right-alignment with a fixed space as separator rather than a left-alignment would work. Could we provide a consistent use of the badge-icons across all the areas they're used? I suppose it's just a missing styling for the search results. 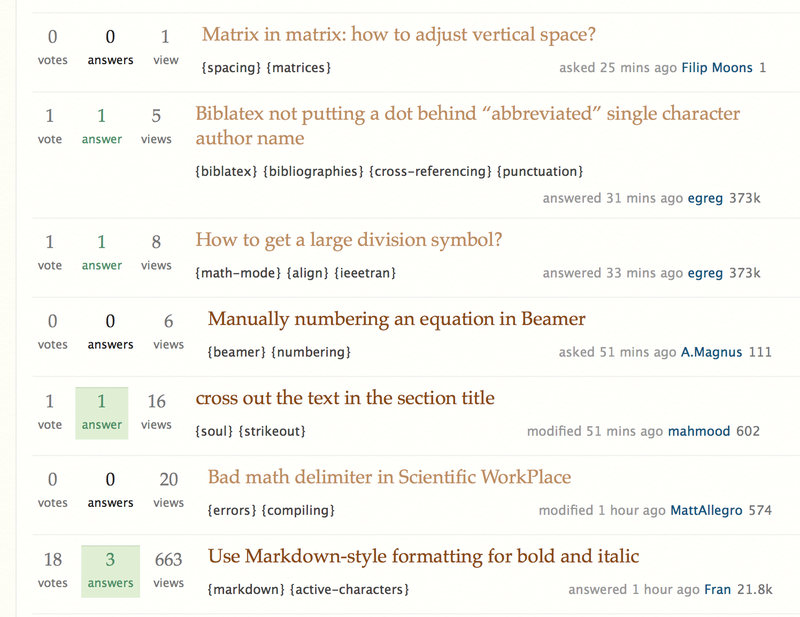 the size of code in comments is noticeably larger than that of text. this may actually be a good thing, because otherwise the shapes of some letters are close to identical in the two styles. In the image above, the close button of the pop-up is almost invisible (yes I know that I can click anywhere to close this window...). Interestingly, the same pop-up in SO has slightly brighter color. when booting up a new session (presumably with an empty cache), the number of questions on the new page is exactly two. the option to increase this to 15/30/50 entries is offered (and the change, once made, persists), but the initial impression is very disconcerting. 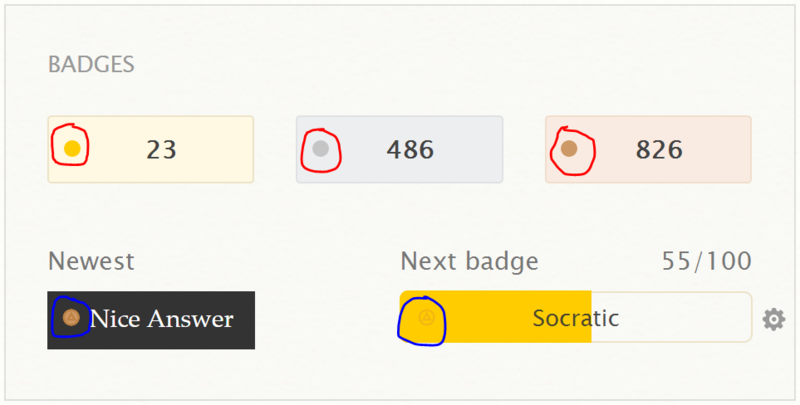 Howering over a community in the profile page shows up the reputation and number of badges, but the badges are cut-off. Since the update, if I want to add a picture to a post, after selecting the picture I want to upload, I have to click on the 'Add picture' button in the 'Add image' dialogue rather than being able to just hit 'Enter'. This is driving me nuts so I'm hoping it is not a 'feature'. This doesn't seem desirable -- the font was designed not to be letter-spaced, and letter-spacing it is distracting. Where is the "log out" option ? "Well, this is not the page where I wanted to leave a comment, this is the front page !" Why are these questions not properly aligned? 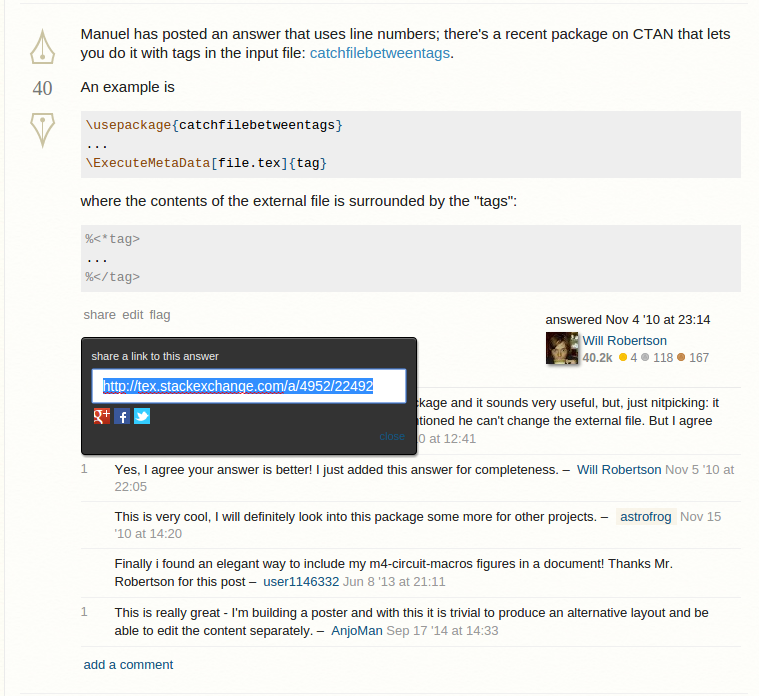 Which image to use in community promotions ads of other Stack Exchange websites for TeX.SX? What eats my name?! And how to fight it? What should the site design look/feel/smell like? What are the RGB values of the background color of tex.sx main site?